I don’t know if it’s because I’m getting older (and wiser) but I just don’t feel the need to go overboard with Christmas decorating anymore. 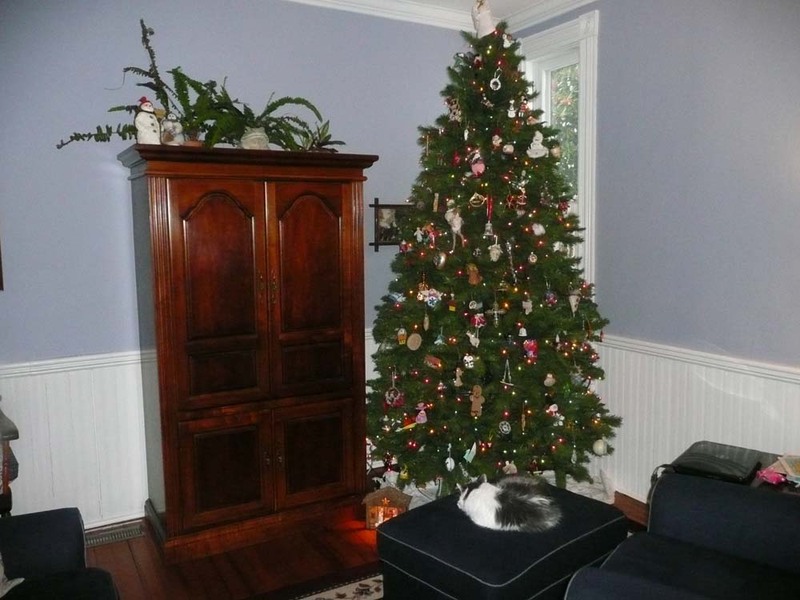 I used to put up several trees in different areas of the house and now it seems like such a chore to get one up. I have a collection of snowmen that haven’t seen the light of day for the last three years. The parlor hasn’t had a tree in it for as long as I can remember which means my antique clip-on bird collection is now collecting dust. I believe a part of my decorating funk has to do with how totally commercial and crass Christmas has become. Most people under the age of 18 don’t even have a clue what Christmas is about other than getting more stuff! I really want to celebrate Christmas for what it is, a remembrance of Jesus’ birthday. 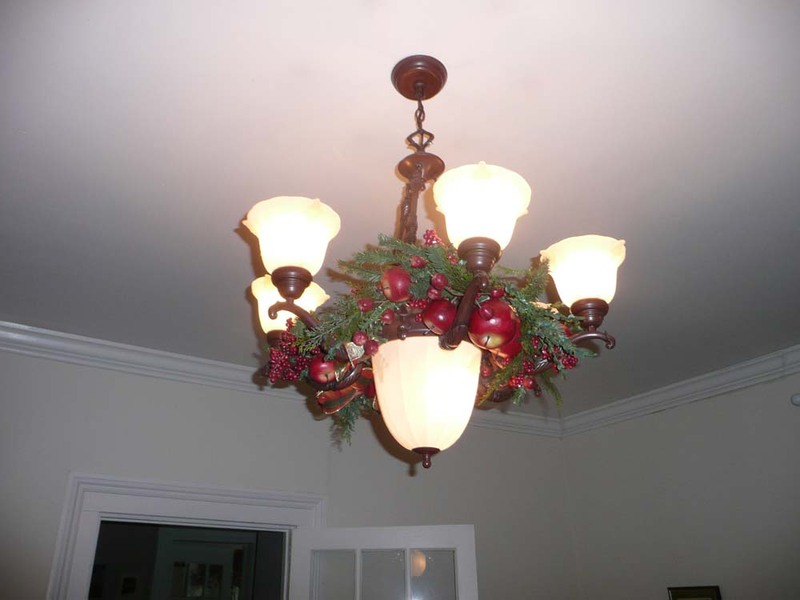 I don’t want to be entirely Scroogy either so this year I decided to have “a little bit of Christmas” around the house. Let me show you what I mean. 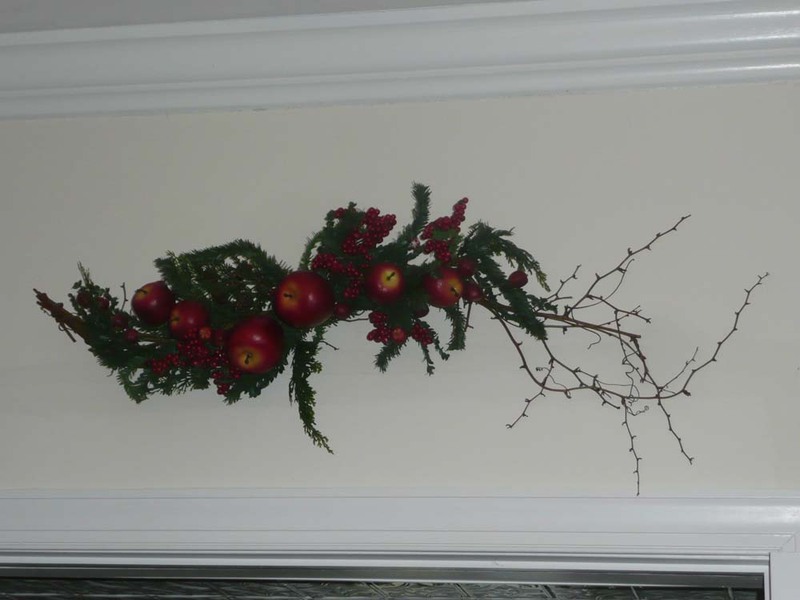 This pretty apple and berry wreath around the dining room chandelier was made by my long time friend Donna McLeod from Snow Creek Farm. 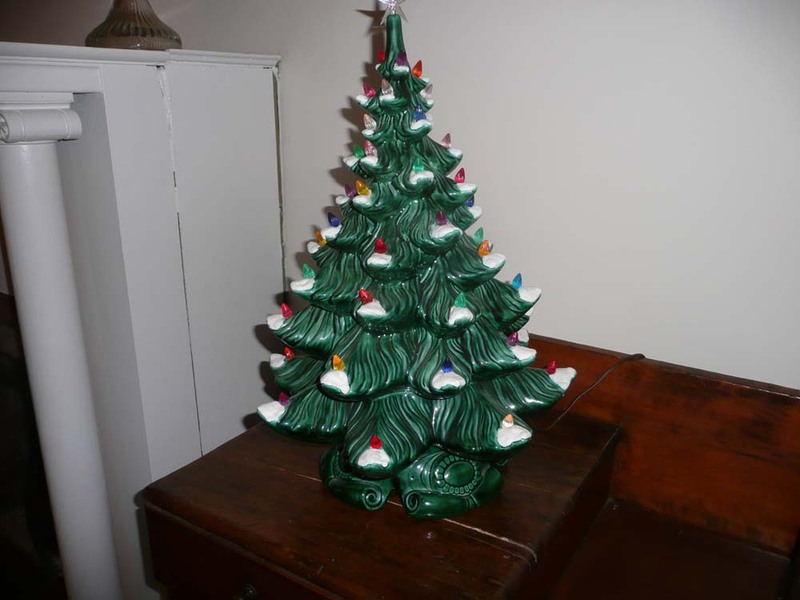 This is a really BIG vintage ceramic light up tree. I love these so much and I always sell out of the ones I get in the shop. When we are not in the dining room we leave the lights on as a kind of night-light. It’s just so homey. So here is a look at the dining room, as best as I could get it, with all three elements in the picture. I may add some fresh magnolia and holly (not the cat) to the mantle and an embroidered Christmas runner on the table and call it a day. 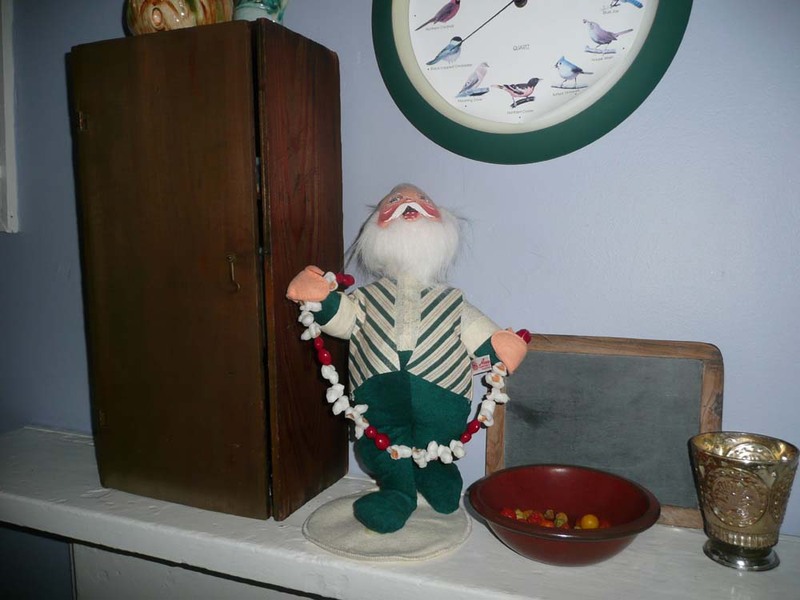 This funny little Anna Lee Santa was my mother-in-laws but she was nice enough to give it to us. He likes it on the mantle in the kitchen and has spent many a Christmas there. 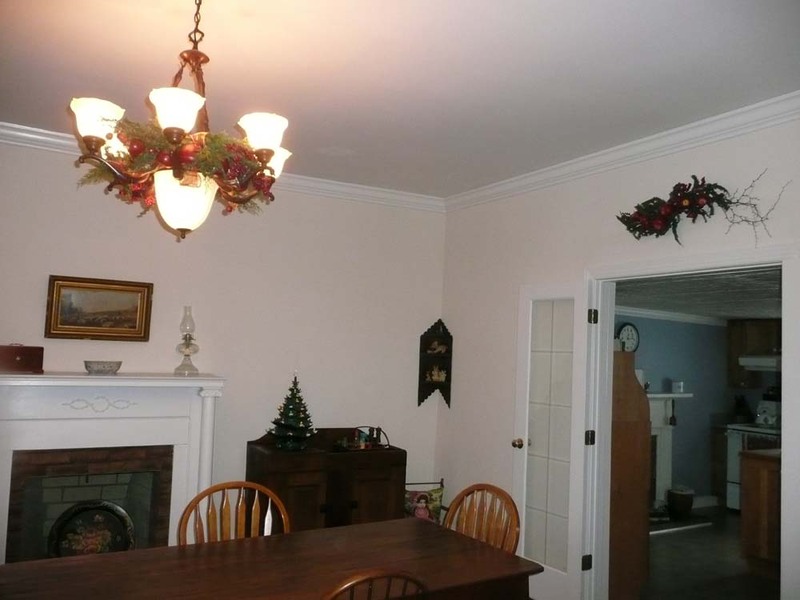 This part of the foyer usually sports three rustic trees with outdoorsy and camping ornaments. 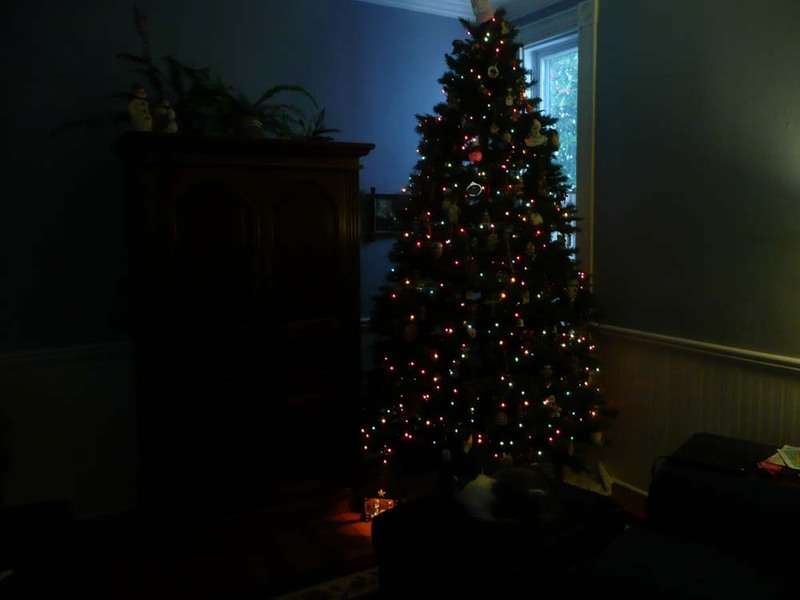 This year, however, I decided to see how Louie does with the big tree before I temp him with three small ones. 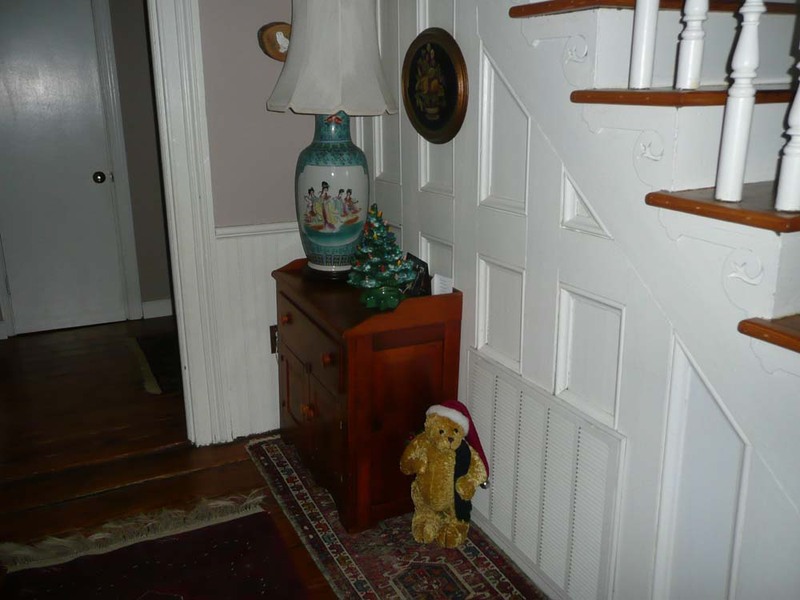 The teddy always sits in the foyer and yes, it is another vintage light up tree on the cabinet! There is nothing little about this Christmas decoration. It may not seem like it in this picture but this tree is 10 feet tall. We have really tall ceilings and our 6 foot tree just looked ridiculously small in our house. We upgraded to this big boy last year. My favorite ornament is the paper plate and doily angel tree topper Adam made when he was little. And look, Louie seems like he’s dreaming of Christmas. Oooh, look how pretty it is with the lights off. 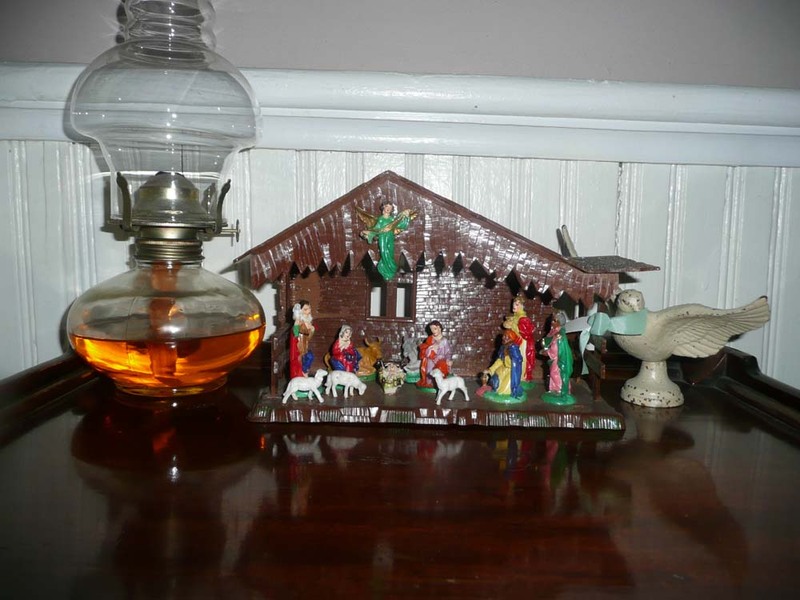 Do you see my vintage nativity lit up under the tree? Well that leads me to one more Christmas decoration we have out. I love this 1960’s vintage creche. It reminds me of my childhood! Well, that’s the Christmas tour of the Hausers house. I realize that we won’t be featured in any decorating magazines for our Christmas displays but I am very happy with what we have. We have enough to remind us that this season is special without being hit in the head with the crass commercialism of today’s Christmases. We will have special dinners and plenty of home-made treats. We will have enough presents to exchange with each other and with our whole family. But best of all, we will have each other! Merry Christmas to Martin and Adam, I hope you like the decorations!!! Funny, I feel the same way! Going through all of my ‘collection’ but not really inspired to put it all up. Somehow want it to be simple this year. Time will tell if I can bear to leave some of my things in their boxes for the season. Love it all, Helen, Merry Christmas to you and Martin and Adam. I really miss you. Amen, Helen! I’m with you on the commercialistm of Christmas and forgetting what is important. I think your house is beautiful! Merry Christmas! put this informative article together. I once again find myself spending way too much time both reading and posting comments.